Welcome to Pittsburgh’s first theater, brewery and full service bar housed under one roof! The Newly remodeled Parkway Theater/Film Lounge is OPEN for Happy Hour, sports games and short run film screenings. We can’t wait for you to experience the Film Lounge, Abjuration Brewing and 45 seat theater screening room! 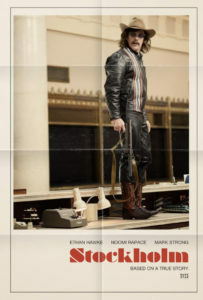 We want the Parkway Theater to be the definitive cinema of choice for ﬁlm lovers and ﬁlmmakers alike. 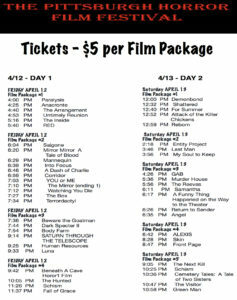 The Parkway Theater will get you excited about learning more about the ﬁlms you see, showing a variety of new domestic independent ﬁlms, documentaries and foreign ﬁlms. Come celebrate ideas and promote the appreciation and understanding of ﬁlm. We’re looking forward to an exciting new year at The Parkway Theater. We hope to see you all here. Watch your inbox for updates. You can sign up for our newsletter by entering your email address below. Two recovering addicts strive to help South Florida junkies get clean in Pat McGee and Adam Linkenhelt’s insightful documentary. As if it weren’t difficult enough to survive their drug habits — as well as lives on the streets — addicts in Delray Beach, Fla. must also contend with a predatory healthcare industry that views them as a source of continued profit. 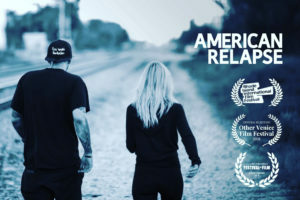 That’s the argument made by “American Relapse,” directors Pat McGee and Adam Linkenhelt’s illuminating documentary about two recovering addicts, Frankie Holmes and Allie Severino, striving to get desperate men and women the help they need. American Relapse views an obscenely lucrative drug-rehab industry through the eyes of two people trying to do good while making a buck. Recovering addicts Frank Holmes and Allie Severino cruise the streets of Florida’s Delray Beach, the “recovery capital of America,” trying to get drug users to enter detox while dealing with roadblocks caused by both our health care system and the biology of addiction. Lacking in some respects but an eye-opener for those who’ve never dealt with this world, the doc is more involving thanks to its narrow scope, even if that tight focus leaves us with unanswered questions. It is our wish to showcase the work of filmmakers from around the world as well as the many great filmmakers in our local area. 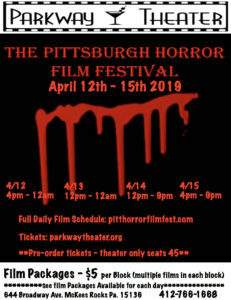 Pittsburgh Horror Film Fest is a horror film festival created by horror filmmakers for horror fans that is held in Pittsburgh Pa., every April. As film auteurs ourselves, we appreciate the blood, sweat & tears that go into making movies. We also understand that the fans are ready for something different!